If you’re like us, cool kitchen and dining ware that are both high on utility and style will get you super excited. Whether you’re short on time or energy, but find cooking therapeutic, you’ll fall in love with Tupperware’s products that help you become a masterchef at home. Speaking of masterchefs, channel your inner Nigella Lawson to bake decadent desserts, yummy cakes and cupcakes or even a batch of fresh muffins in the morning. With Tupperware’s Speedy Chef, beat, whip and whisk cream, egg whites, pancakes, omelettes and mayonnaise. Since it doesn’t need electricity, you can now have your cake and eat it too! Check out the product details here. Feel like recreating some magic in the kitchen, but end up chopping onions with tears streaming down your face? There’s no need for any sadness with Tupperware’s Xtra Chef. With chopping skills that’ll put Jackie Chan’s moves to shame, prep for your meals and chop away fruits and vegetables with minimal effort. We’re sure your house proud self is going to beam with joy after using this super cool gadget, with the ease and effortless style of the most seasoned chefs around. Chop It Like It’s Hot! While chopping with style may get you excited, we’re ready to take it to next level. Whether it’s preparing yummy dips for your next house party or preparing chutneys to pair with mouthwatering tikkas for your relatives, take your kitchen game to the next level with Tupperware’s Smart Chopper! No more woes regarding sharpening kitchen knives or accidentally cutting your finger, because this chopper is super useful in chopping fresh fruits, vegetables, herbs, nuts and even boneless chicken and fish. Cook with simplicity, but a whole lotta style. Know more about the product here. 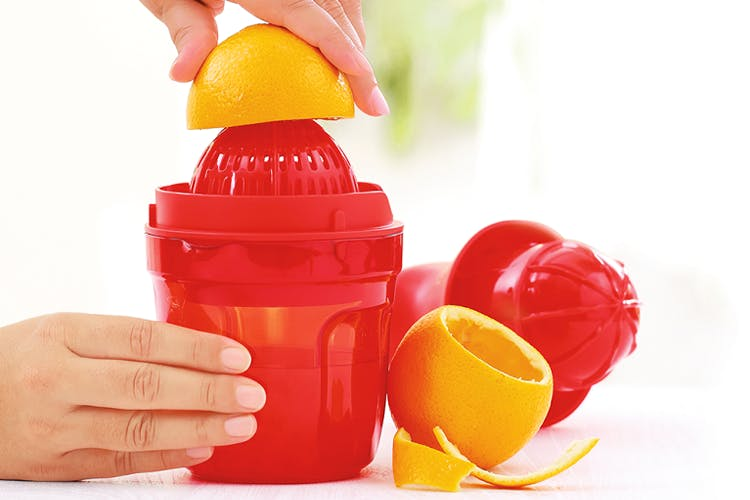 If prepping for a meal is getting you thirsty, then it’s time you try and enjoy the super handy juicer, Tupperware’s JUIST. A refreshing glass of juice is exactly what you need, whether you’re beating post workout exhaustion or starting the day in a hurry. Power up with freshly squeezed juice, and get your health fix wherever you are with their super convenient and portable juicer. Know more about JUIST here. Bring some order and functional drama to your kitchen with Tupperware’s wide range of household products! Follow them on Facebook, Instagram and Twitter to stay updated about their offers. Visit their website to browse through their catalogue.